Document, analyze and research the experiences of CEE and other organizations in EE and ESD. CEE intends to research, document and analyze the diverse experiences in EE and ESD of its own projects and programmes, as well as those of other organizations in India and the rest of the world. The objective is also to learn from these experiences in order to strengthen the content, form and effectiveness of education and communication programmes and activities in the DESD. To this end, CEE has launched the first peer-reviewed international journal on Education for Sustainable Development, to serves as a professional forum for academics and practitioners around the world. This Journal, which is published twice a year by Sage Publications, serves as a place to present research, debate ideas, and showcase success stories. 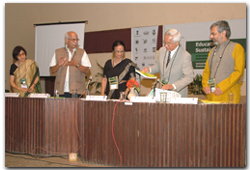 The first issue of the Journal was formally launched at the Fourth World Environmental Education Conference which was held in South Africa in July 2007. Education for Sustainable Development (ESD), an emerging field worldwide, is at a stage where academics and practitioners are eager to share and keep abreast of innovations in thinking and practice. At the same time, the volume, quality, and nature of experience in this field are substantial enough to warrant a journal for documentation, publication of research, and reflection. A journal devoted to ESD becomes even more relevant in the light of the fact that United Nations General Assembly declared 2005-2014 as the Decade of Education for Sustainable Development. Throughout this decade, educators will engage in a variety of efforts to promote teaching and learning about sustainable development. Values-driven: inspired by a set of values that include respect for the environment, social justice, and human rights. Locally relevant: addressing community as well as global issues. The learning methods used in ESD involve visioning of ideal future scenarios, critical thinking, problem solving, participatory decision making, and use of multiple methods of learning, including art, drama, and experiential learning. The Journal of Education for Sustainable Development (JESD) is a peer-reviewed international journal, aimed at global readership, with an editorial board comprised of leading ESD educators from around the world. The scope of content covers all fields of formal and nonformal ESD. We solicit articles from academics and practitioners in the developing world, along with those in the industrialized world. This focus on developing world research sets JESD apart from the other leading English-language academic journals, which focus mainly on the United States , Australia , UK and Canada . Articles are sought from the fields of environmental education, which has pioneered much of the work in ESD; from economics education, where a small number of academics are challenging old theories and testing new ones; and the humanities, where the issues of social justice are largely addressed. Because there are a number of journals for environmental education, we are especially interested in articles from the areas of economics and social sciences. The journal is published twice a year. It contains well-researched articles and critical essays and analyses on philosophies, policies and issues; substantiated reports on innovative projects, activities, initiatives and best practices that have relevance or implications for other practitioners; reviews of educational materials and programs, and news on latest ESD materials and how to access them, upcoming events, highlights of relevant conferences and meetings, and information on grants or requests for proposals. The articles are of three kinds: conceptual, descriptive, and those based on empirical research. Conceptual articles are thought-provoking essays on approaches to ESD, with the intent of engaging readers in a discussion that will move the field forward. Descriptive articles report on successful (or unsuccessful) projects that can offer ideas or lessons to practitioners. Research-based articles develop, test or advance ESD theory, research, or practice. Research notes will comprise exploratory survey research, methodological studies, and replications and extensions of past research. Such submissions must, however, make important contribution to knowledge relevant to ESD. Observations and remarks on articles published in the Journal, if relevant and timely, could be published as comments. The journal also publishes reviews of books, videos/films, curricula, and other print and non-print ESD materials and programs. The reviews provides the context, describe the content, and assess the strengths and weaknesses of the material or programmes. One section of the journal focuses especially on students' interests and concerns by publishing abstracts of research being done at various universities around the world, relevant information, and academic advice. The journal also publishes international news and events related to the UN Decade of Education for Sustainable Development. Conferences, regional workshops, and action projects will be sponsored by UNESCO, UNEP and various NGOs throughout the Decade. We will keep readers apprised of upcoming opportunities for participation and reports to the UN General Assembly related to the progress towards the goals of the Decade. 3.Select the Journal and remit payment .